Hello everyone, how are you? I hope well! I can't believe it's Autumn now and the holidays are only a few months away, and then 2017 is just around the corner! But first, the American election... Wow what an election, right? I honestly can't believe it when I read the news and Facebook each day. So many different viewpoints and arguments. It's so heated, I've never seen an election quite like this one before in my lifetime. With so much going on right now, I thought today I'd just bring some visual inspiration and keep things light and easy. So much of life is heavy, sometimes you just need to zone out - not because you are ignoring what needs to be done but because you need to rest your brain so you can make the best choices after your break. I particularly need a break now because I've been really busy with lots of things in my life. Travel, childcare (we lost our daytime childcare so we are balancing our son full-time until we find a solution), book promotion, new business collaborations, projects, upcoming travel... It's all very exciting and some of it, stressful, but what keeps me in balance is allowing myself time to take a mental break and zone out a little. Early bedtime when I can. Eating light. Exercising more. These things greatly contribute to my overall well-being. 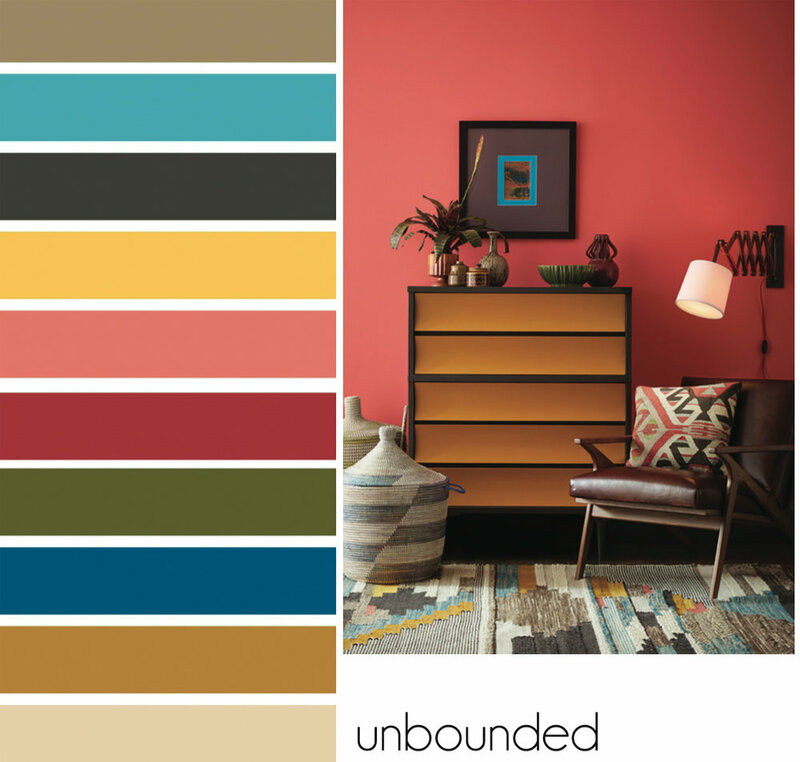 Today, let's look at some color forecasts for interiors from , an American leader in paint, for 2017. They've predicted these 4 palettes to be big in the new year. After looking at them and reading the description, I'd love to hear from you - which one is your favorite? I'll tell you mine at the bottom of this post. Intrepid - The virtual and the real are blurring in the form of seamless commerce and “office anywhere” collaboration. Impatient for social and political change, we’re reinventing ourselves first. Identity has never been more fluid. “You do you” is the mantra of a generation primed for self-expression, cheered on by their own #squad and tossing aside old categories. There’s a feisty energy to our present moment, arriving in fiery tones and vibrant, kimono colors. Noir - It’s among our most precious commodities: night. We’re craving a refuge from urban streetlights and glowing screens, space to turn our gaze inward and recharge the spirit. Mindful melancholy is fueling a new romanticism marked by medieval patterns, revived customs and bittersweet beauty. The Dutch masters knew the secret: dark hues set a dramatic stage for sensuous luster. 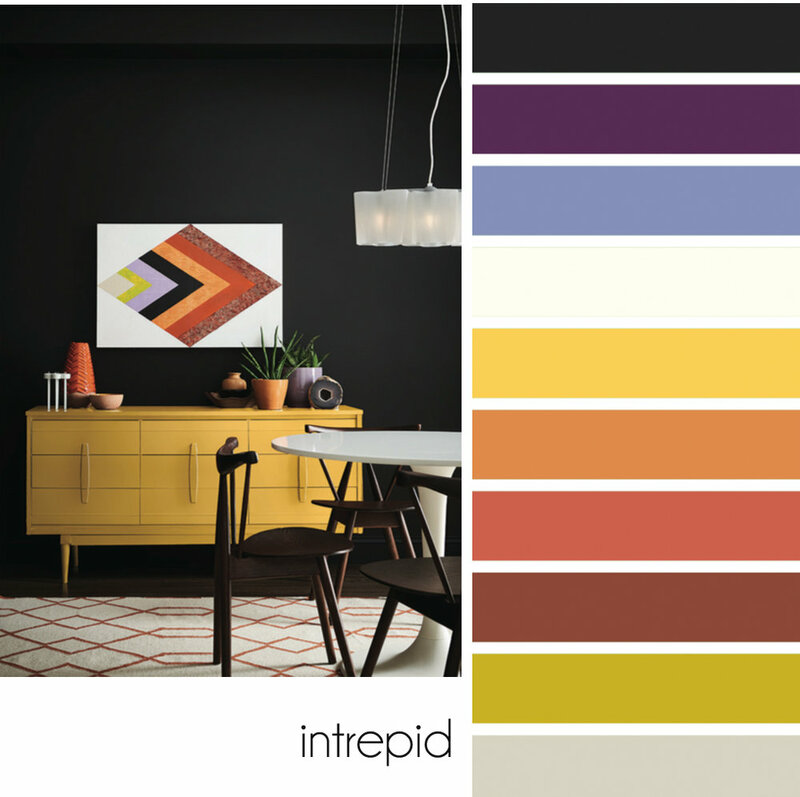 This palette is rich with vine- ripe fruits, Nordic blues, moody neutrals and golden yellows. Unbounded - Global immigration is redefining borderlands, national identity and our sense of coexistence. We’re all citizens of the world now. Brands are becoming more purpose-driven, communities more connected. Design is adapting to more diverse populations. Overconsumption is, well, over. We’re more likely to invest in the best we can afford — crafted and customized — and then keep it forever. Global consciousness is a mural painted in earthy mustards, ocean blues, corals and mud. Holistic - Sustainable design and radical transparency are the new standards. As our daily transactions move further into the cloud, acquiring experiences is becoming preferable to buying more things. “Doing good” is the new looking good, and it’s taking the form of “voluntourism,” healing retreats and eco-travel. We’re in pursuit of an elusive ideal: a fair luxury. The roads of this journey are lined with arctic neutrals, blush rose and wild browns. Which is your favorite? I really love noir. I love how they've described it as "Mindful melancholy". I normally gravitate towards light, soft hues and a more Scandinavian palette, but moody tones are definitely on my radar at the moment and have been for a few months now and I imagine will continue from now into the new year.